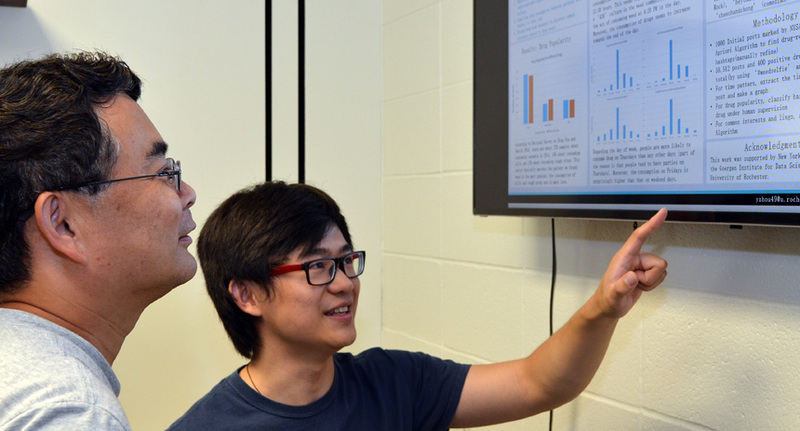 Xerox fellow Yiheng Zhou discusses his project with his mentor Jiebo Luo, associate professor of computer science. Jiebo Luo does not like to keep a promising research topic waiting, especially in a field as explosive as machine learning, computer vision and data mining. “If you sit on a project, three months later somebody else will have done it,” says the associate professor of computer science. That’s why Luo has welcomed Xerox fellows like Yiheng Zhou, a rising senior in computer science, into his lab each of the last three summers. Zhou began doing research for Luo last fall as a course project. He is using his Xerox fellow opportunity this summer to expand his previous work – using data mining to track Instagram for drug use and drug dealing – into a broader project linking various risky behaviors, such as smoking, drinking, drug use and eating disorders. By accessing millions of postings on Instagram, Zhou can look for correlations between risky behaviors on a much larger scale that traditional studies that involve, say, 20 subjects who undergo interviews over a period of time. Initially a chemical engineering major, Zhou switched to computer science because it interested him more as a future career. “I’m good at math, and programming is very cool,” he said. Zhou even turned down a promising summer internship with Ernst and Young, the multinational professional services firm, to stay on in Luo’s lab this summer.